DISCLAIMER: This is any Item or Assembly for sale that may have a rough appearance due primarily but not limited to milling, dents, scratches, uneven finish and missing or poorly applied stenciling. The term blemished applies to any defect to the appearance of the item or assembly sold and does not affect its function. CBC Industries is pleased to announce their Generation 2 upper assembly featuring a 7 sided Keymod Rail , perfect for 3 gunners! This AR-15 upper assembly is made from the highest quality material found in the AR world! The upper is assembled in Charleston, SC with high-quality material, meticulous workmanship & incredible prices. The 16” 7.62×39 barrel is the perfect marriage of AK 47 & AR-15! It has the take down power of an AK but the functionality and accuracy of an AR-15! 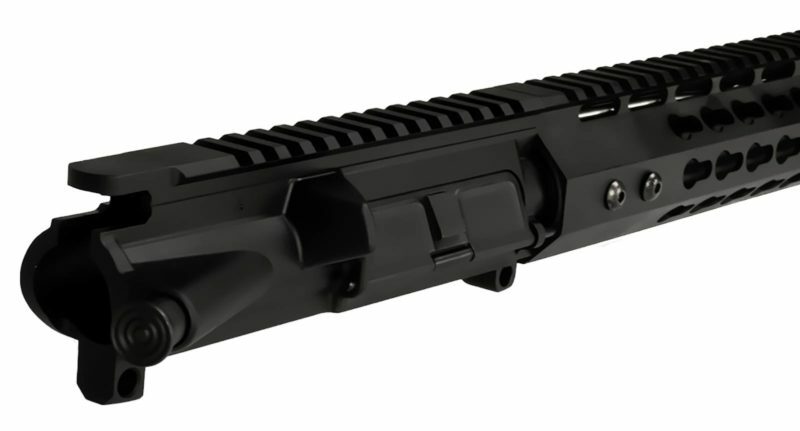 This barrel has a 1:10 twist rate, carbine gas system and head spaced twice from the US manufacturer. It is made from the strongest steel in barrel world, 4150 Chrome Moly then nitride coated for durability and accuracy! This incredible rail has 200% increase in keymods, so your attachment position options are endless! This rail was designed for shooters that want BUIS at 45 degree angle with no additional costs for attachments.The rail is a 13” CBC Keymod rail made from Airplane Aluminum and then hard coat anodized to improve the strength! We assemble our uppers exclusively with Veterans of our Armed Services! These military men have an eye for detail, they scope port holes, torque to military specs & quality check each upper.